For an RVer, I’ve been rather behind the curve on many things. Navigation has been done using road signs, paper maps, and route notes on a clipboard. I have always been pretty good with directions and orientation, so that worked. However, after reading Andy’s post about the Garmin USA app on his iPad, I saw the wisdom and convenience it could provide. Since I would be traveling in many unknown areas it sounded pretty useful. So, I got the Garmin-iPad combo prior to heading out for my northwest trek in April. US Public Lands: mapped boundaries of BLM, NF, NP, COE, etc. The mapping apps are especially helpful when looking for boondocking spots. With the iPad mounted just to the right of the steering wheel, and barely above the top of the dash, it’s a quick glance to see the screen. No blocked road view and or looking away. And, it is conveniently next to a 12V outlet to keep it charged. Running the app can use up the battery quicker. I found a 2A plug that provides enough juice for the iPad. Plus, the iPad mini 2 with Retina display and cellular Verizon will be the eventual replacement for my aging iPod touch. So, I also have all the utility that a tablet provides with internet, calendar, contacts, mail, messages, notes, first aid, music player, camera and numerous other helpful apps. It’s my news reader using Flipboard, and eBook reader. Eventually I’ll find time to sketch on it using the ArtRage app. I have some Benchmark Atlases, local maps and reference material I still use. And of course, the laptop is great for trip planning and journaling. With these tools, I’m now up to speed for navigation and travel advice. 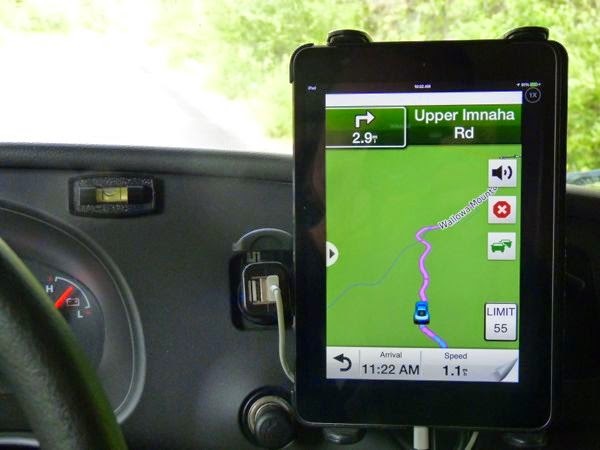 Note that the cellular version iPad includes a GPS receiver; so, the Garmin app can be used without an internet connection. The large display makes it easy to see with these old eyes. I’m really happy I bought this combination for GPS plus more. In 13 years on the road, there were lots of changes. When I started, it was a combination of maps and atlases for travel. Mapquest was helpful. However, that depended on access to the internet via dial up at very slow speeds. It was adventurous travel with maps and limited research. Eventually, I broke down and purchased a GPS Navigator after too many wrong turns and dead ends when in large metropolitan areas. Doing that with a one ton diesel truck does not make for a pleasant experience. 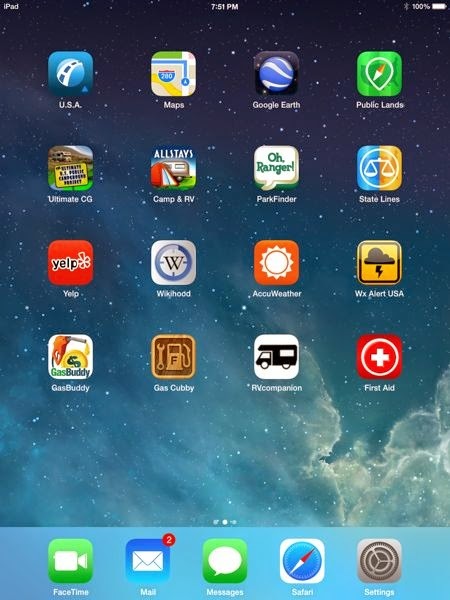 Then in April 2010 with the new iPad, the RVing life became easier as apps were created addressing the needs of the RV traveler. Now there is more gadgetry I could purchase — if I was still traveling. It was a fun ride beginning with maps and stopping travel with a GPS Navigator. (Still used for getting around Tucson.) There are lots of stories about getting lost or ending up on a road where there is no place to turn around. Those were memorable times. An interesting history. For sure things are much easier now with our gadgets. Hope you’re enjoying your new situation. I still use road signs, paper maps, and route notes on a clipboard. I also have a Garmin (regular old model) that I like because it tells me my speed, and the number turns red if I go over the speed limit. I just glance at it now and then, often turning the annoying voice off. I can see the value of the newer technology for an RVer, especially when it comes to boondocking sites, etc. 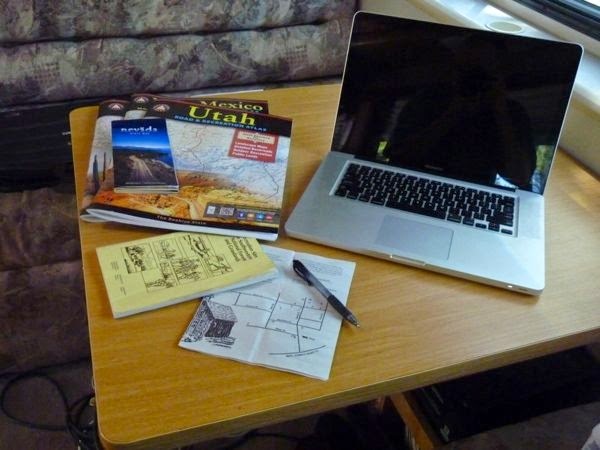 Frankly Gypsy, I still use the maps and notes too when trip planning. But, I’m gradually learning to use the new digital technology to make things easier. Glad the post was helpful. Thanks for commenting and following my journey. This makes a lot of logical sense, and is where I would “like” to be. 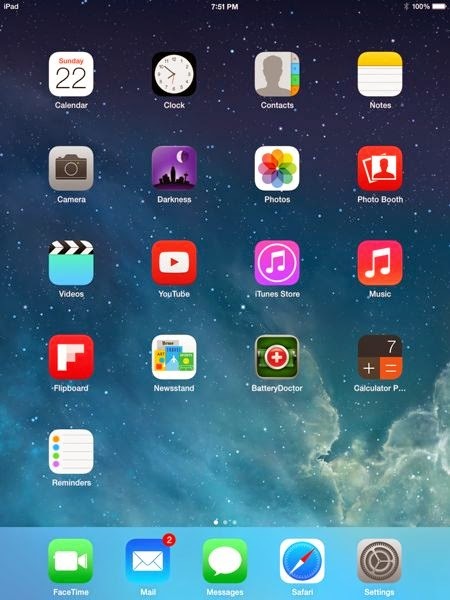 The ability to use all of the apps is great, as required. And I love the newer iPad minis. We have a very old iPad2 without cellular at the moment, so by nature, that lacks the GPS antenna, even if we use a cell phone as hot spot. But from my reading the GPS navigation apps are always somewhat sub-par, I suppose, as the companies try to get the best of both markets without cannibalizing their dedicated GPS business. Have you had any more revelations in the past two years of using this set up? And new recommendations you would make? Thanks for sharing the link on the Lazy Daze Owners site. Again, this is without a doubt what I “want” to do. This setup has worked superbly for me. I’m not sure what you mean by subpar. That may be true for apps that rely on the internet. Since Garmin USA has downloaded maps, and is updated often, it appears to be just as good as dedicated GPS units. Be sure you only buy the one called Garmin USA with North American maps, as there are several versions of the Garmin app. Hope you find something that works for you. Thanks for the feedback, and that is certainly good to hear. I’m reading something entirely different in the reviews for this App on iTunes. I assume you have kept your iOS updated? — from my read, the app has gone from good to bad in terms of usability based on these updates. Did you experience that? Or is it just operator error on their part? If you have recent experience with this app under iOS 10.2, and still find it to be excellent, I will probably give it a try. Thanks much for your feedback, and BTW, I think your website is very nicely organized, with lots of information. Congrats on being able to sell many of your paintings. What a great hobby and talent. I am still using iOS 9.3.5. The app has been updated a couple of times just recently; so, it may have corrected the issues. I really don’t know. Remember, there are several versions of the app. The one called Garmin USA is the only one worth getting. I suppose the only way to know for sure is to try it yourself. Thanks for the kinds words about my site.